Exploring for Truth: Mizpah (Genesis 31:49) - OUT OF CONTEXT SCRIPTURE! The story contained within the whole of Scripture is just that - a STORY, a single interconnected story. Sadly, way too many church-goers make it a practice to treat God's Holy Scripture as a buffet of quaint sayings from which they can pick, choose and use in any way imaginable, even if the result is in no way related to the original intent of the verse in its context. The Bible is not made up of thousands of disjointed pieces of "wisdom" and motivational sayings that we can choose and use to make a point or to produce feel good statements as desired. There are many parts of Scripture that when used out of context may still produce a valid point that doesn't stray too far outside the realm of the original intent, but then there are others that cannot, and they end up becoming twisted and distorted so much that they imply almost the opposite of their original meaning. We find this verse most often used as a kind of mushy statement for when we depart from someone's presence, stating that God will watch between us while we're apart. Sure, that is a nice sentiment, but is that what this verse is actually saying in its original context? Not at all, this watching being spoken of is more of a judgment style of watching - asking God to keep an eye on both parties to insure they do not break the agreement. 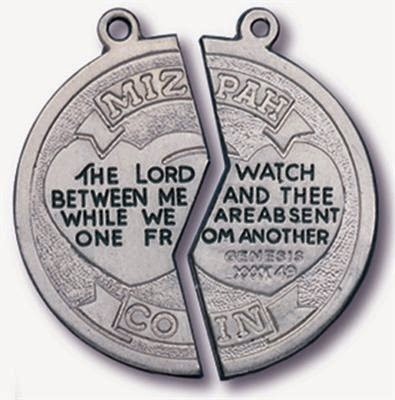 Mizpah is Hebrew for "watchtower" and is used to mark an agreement between two men, with God as their witness. In our biblical text in Genesis the story is that Jacob has secretly fled the house of Laban, his father-in-law. Jacob leaves, taking his own flocks of animals and other assets, as well as his two wives and their children (the daughters and grandchildren of Laban) with him, intending never to return. Laban discovered this and angrily pursued after Jacob. Once they are together, they discuss things and explanations are made for the actions taken, and Laban agrees to let Jacob go in peace, but exacted a promise from Jacob to never abuse his daughters or take additional wives (Genesis 31:50). I wonder why the necklaces do not contain the part about oppressing the daughters or taking other wives? In the end, we have yet another popularly used Scripture reference that is actually being used completely out of context and to imply a meaning it was never intended to construe. This verse is not something to use when you and your significant other are separated - that is, unless you are saying you establish this because you kind of don't really trust them, and so you hold them accountable under God's watch while you're apart. It is this kind of mishandling of God's Word that continues to take the church far off the path of truth and further down a path of abuse to God's Word and ultimately theology as a whole. I recently gave a sermon on the importance of reading the Bible in it's entirety and doing so frequently, touching upon the right handling of God's Word as well. 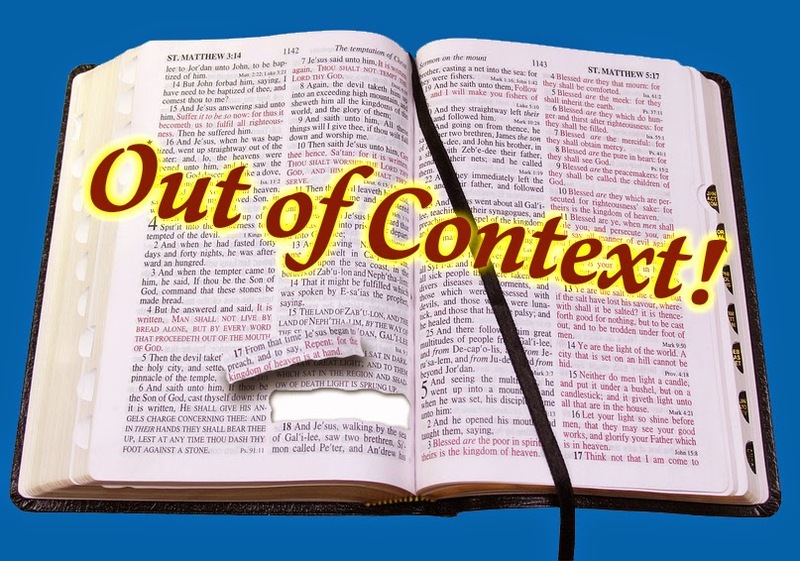 It is important that Christians read the whole story, in it's context, and often, in order to understand the one whole story contained within His Word, and to avoid ripping parts out of context.